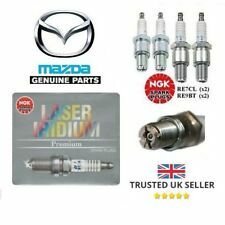 MAZDA 5 1.8 06/05- L8 NGK LASER IRIDIUM SPARK PLUGS x 4 ITR6F13  NEW! 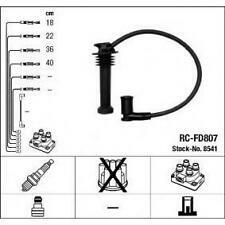 Cables bujia encendido NGK8541 - RC-FD807 - Ignition cable kit - FORD-MAZDA-VOLVO-TRIUMPH. MAZDA RX8 from 2003 Onwards (ALL MODELS). 2 x Spark plugs for the TRAILING CYLINDER # RE9B-T. Genuine Mazda (NGK Laser Iridium) Rotary Spark Plugs. 2 x Spark plugs for the LEADING CYLINDER # RE7C-L. UK's NO.1 for Japanese Tuning Parts. Mazda Rx7 FC & FD Genuine NGK Platinum Spark Plugs Set of 4 BUR9EQP (5255). 4 x BUR9EQP spark plugs used for both Trailing (top) and Leading (bottom) chamber. Note: from factory a fractionally hotter plug was used for the leading (bottom) plugs however the general consensus among the Rx7 community is with even slightly modified Rx7’s the cooler plug setup is better for longevity and reducing the risk of detonation. 2.0 MZR 147bhp. 2.0 MZR 155bhp. Mazda 6 (GH). Set of 4 Bosch Super 4 spark plugs. These spark plugs are compatible with the following Mazda vehicles These high-performance spark plugs operate based on the state-of-the-art surface air-gap principle. NGK SPARK PLUGS FOR CARS > NGK LASER IRIDIUM SPARK PLUGS. Product Version: LASER IRIDIUM. Centre Electrode Material: IRIDIUM. Product Type: SPARK PLUG. Make: MAZDA. Year: 05/07-08/09. 100% SECURE. Engine Type: L3 Turbo. Mondeo MK.I & MK.II (93 - 00). Mondeo MK.IV (07 onwards). Ka (02 - 08). Fiesta MK.III (92 - 95). Fiesta MK.IV (95 - 02). Fiesta MK.V (01 - 08). Set of 4 Bosch Super 4 spark plugs. Fiesta Van (03 - 08). Mondeo MK.III (00 - 07). 4 x Bosch Double Platinum spark plugs. These spark plugs are compatible with the following vehicles Bosch Double Platinum Thread Pitch: 1,25 mm. Spark Plug Specification. Spark Position: 4 mm. Mondeo MK.I & MK.II (93 - 00). Mondeo MK.IV. Fiesta MK.III (92 - 95). Ka (02 - 08). Fiesta MK.IV (95 - 02). Fiesta Box (03 - 08). Fiesta MK.V (01 - 08). Fiesta MK.VI (08 onwards). The table below shows part of the Denso guide for the vehicles these are listed for. If you are unsure of the part number you need the Denso E-cat can be found at. 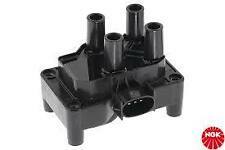 MAZDA O.e numbers Z60118110 ZJ4618110 ZJY618110. Denso TT Spark Plug T20TT. Manufacturer Part Number 4617. Excellent value for money. Made in Japan. MAZDA 5 2.0i 16v DOHC (cr19f-lfd7) 01/05-02/08. MAZDA 5 1.8i 16v DOHC (cr198-l823) 01/05-02/08. 17.5mm reach plugs only. MAZDA RX8 Rot. 2 13B MSP Renesis 01/03--> X. Which is no doubt why NGK are the world's No.1 spark plug. NGK Spark Plugs. NGK has the technology to produce plugs for every type of automotive engine, as well as for motorcycles, marine, horticultural and many other applications. In doing so, Bosch is able to call on its more than 111 years' experience in the industry, and its unique cross-system expertise in automotive technology. number before placing an order. 6 x Bosch Super Plus spark plugs. NGK 4 x bujías Mazda RX8 (2 L y 2 traseras T) (255). MPN RX8sparkset. Specifico per: MAZDA MX 5 NA Fgst 308212—> 1.6 66 kW MOTORE B6 DOHC. Le candele d’accensione a marchio NGK sono sinonimo di qualità, affidabilità e durata nel tempo. L'INSERZIONE SI RIFERISCE ALL'ACQUISTIO DI QUATTRO (4) CANDELE. Mondeo MK.I & MK.II (93 - 00). Mondeo MK.IV. 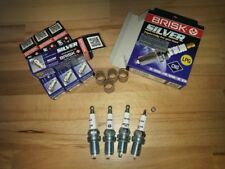 4 x Bosch Iridium Spark Plugs LPG only. 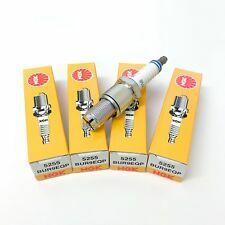 These spark plugs are compatible with the following Ford, Mazda & Volvo vehicles which have been converted to run on LPG. (1) 2 LEADING PLUGS. 2) 2 TRAILING PLUGS. KIT CONTAINS. Please read full listing description carefuly before you order to make sure the part does fit your car. - BOSCH SUPER 4 PERFORMANCE UPGRADE SPARK PLUGS SET FOR MAZDA MX5 MX-5 1.6 1.8. Specifico per: MAZDA RX 8 Sport 2.6 170 kW MOTORE 13B MSP(high power) 09/03-12/10. Le candele d’accensione a marchio NGK sono sinonimo di qualità, affidabilità e durata nel tempo. L'INSERZIONE SI RIFERISCE ALL'ACQUISTIO DI UNA (1) CANDELA. Now Bosch brings these benefits to you in Bosch Super Plus, the longest-lasting copper core spark plug on the market. Jeep Grand Cherokee III (05 - 10). number before placing an order. Jeep Cherokee (KJ) (01- 08). Mazda 2 1.3 08/07 - NGK Iridium Bujías X 4 IFR5E13  Nuevo en Caja! Manufacturer Part Number: IFR5E13. Short Code: 6903. NGK SPARK PLUGS FOR CARS > NGK LASER IRIDIUM SPARK PLUGS. Product Version: LASER IRIDIUM. Centre Electrode Material: IRIDIUM. Product Type: SPARK PLUG. NGK SPARK PLUGS FOR CARS > NGK IRIDIUM IX SPARK PLUGS. Product Version: IRIDIUM IX. Model: MPV. Engine Type: FS. Centre Electrode Material: IRIDIUM. Product Type: SPARK PLUG. Make: MAZDA. Ground Electrode Material: NICKEL. For = Lpg, Autogas, Cng, Gpl, Gasoline & Petrol use. This Sale is for 4x "DR17YS-11-WC" Brisk Silver Single Point YS Spark Plugs. 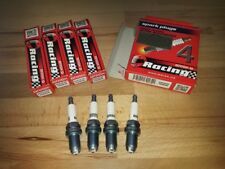 4 x NGK Iridium IR Spark Plugs MAZDA RX8 (2 x RE8C-L and 2 x RE9B-T) 4 plugs. Type:- IFR5E13. 2 (07-->) 1.5 ZY05 1.5 76 08/07 ->. Make Model and Versions.